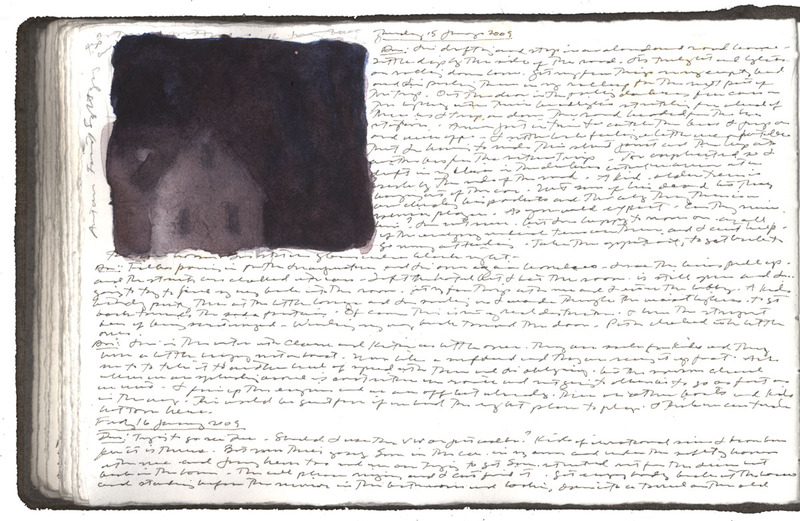 Charles Ritchie, Journal entries for 15-16 January, Book 131, featuring watercolor and graphite sketch of Antares rising, page size 4 x 6″. My first sighting of Antares this season was the early morning of 16th very low in the southeast sky shining out of the bare treetops above the white brick side of the house across the street (see on line journal entry, Antares Rising: Drawing Seasons). A harbinger of spring. Like looking in the yard and seeing the first snowdrop or the daffodils tips prick through. Antares will sweep slowly west through these winter mornings and when it reaches the center of my window among the budding trees it will disappear. The red heart of the Scorpion fades into spring foliage and reminds me my winter landscapes have to rest. On approximately the 15th of April I’ll put them away until next year. Antares itself is not the subject of a drawing, at least not right now. It’s more of a timepiece. One of the pieces that I am currently working on features an old moon coloring the twilight sky (see sketch at left below). A deep blue morning above sparks of window lamps. Saw the subject a month ago and I’m happy to see that same phase of the moon will come around again this week. I’ll study it closely, especially to see the color of the dark side away from the crescent, which is such a different tone than the blue of the twilight surround. So many pieces going now I’m getting confused but I want to stay open to all of them. I wake and write my dreams and then just look up and pick the one that hits me first. Don’t seem to work on the same one sequential nights; trading around so that everything stays fresh. I’m excited about all of them and each is testing me in a different way. I’ll just have to accept that by mid-April some will be finished and some won’t. Let go for another year. Out on errands yesterday I rode across the railroad bridge I looked down and there were hundreds of coal cars rumbling by, each of them filled to the brim with coal. And each black pile was trimmed with an edge of snow. Winter’s nowhere near over. 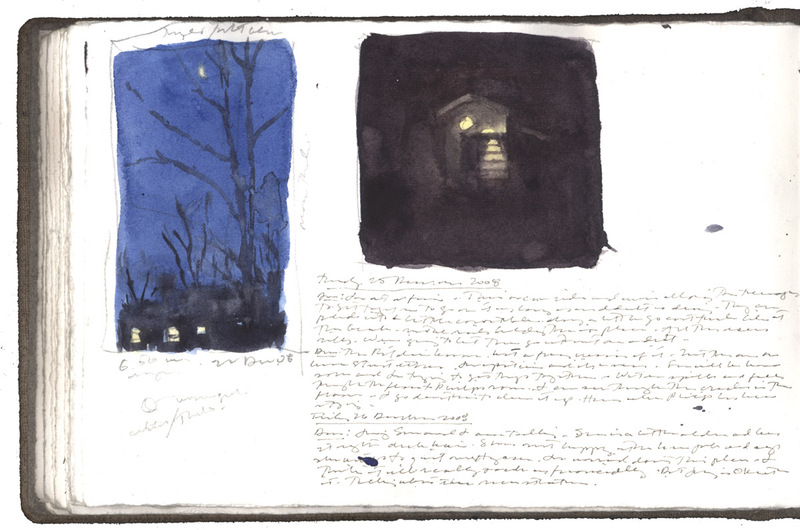 Charles Ritchie, Journal entries for 25-26 January, Book 131, featuring watercolor and graphite sketch of a waning moon made at 6:50 am on 22 December 2008 (left) and a contemporaneous sketch of an outdoor light (right), page size 4 x 6″.